Survey of dental professionals ranks practice management software as the 5th greatest game changer in dentistry. To be grouped among other well-known and respected brands in the dental software market is indicative of how dentists are looking to the Web as a more flexible, more convenient platform to manage their practice. In a survey of its readers, DentalTown Magazine, reported in its January 2011 issue that computerization and practice management software was ranked high among readers for its impact upon dentistry, ranking fifth on a list of the top 50 reported game changers. Specifically, the magazine credited traditional dental software as well as Web-based Curve Dental as having made the dental practice more aware of every aspect of the practice, opening the eyes of the dentist to the business of dentistry. The magazine reported that computerization of the dental practice has been one of the best things to happen in dentistry, that dental practices are running more efficiently and have easier access to their information than ever before. Readers attributed improvements in care and communication to computerization, saying dental software has helped improve patient relationships, allows dentists to provide better clinical care and has increased efficiencies within the dental practice, allowing the typical dentist to see more patients in one day than ever before. DentalTown Magazine is published monthly by Farran Media and has a circulation of 125,000 readers. Based in Phoenix, Arizona, the magazine’s mission is to connect dentists via an interactive, on-line community, provide a voice for every dentist to share information, and publish a magazine that reflects this on-line activity. The magazine’s forum is located at http://www.dentaltown.com. 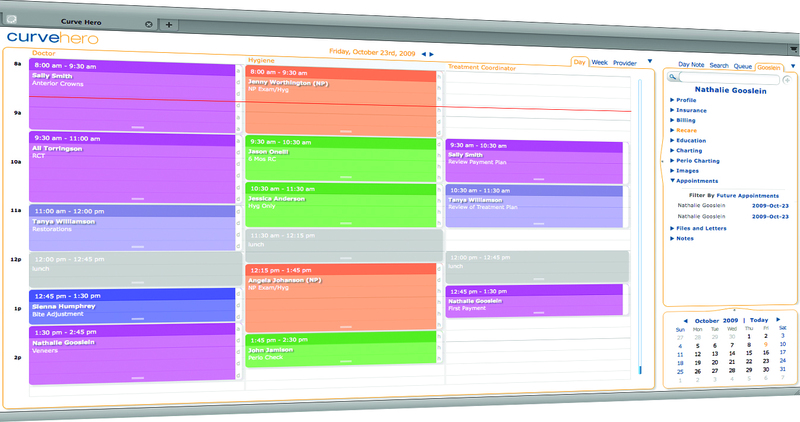 Curve Dental: A fresh Web-based alternative to dental software Curve Hero's web-based scheduler.Utilizing the inherent simplicity of the web, Curve Hero's scheduler makes management of the dental practice's appointments a breeze.